It’s one thing to find out you’re a vampire princess. It’s a whole other thing to actually rule. Newly-married Jessica Packwood is having a hard enough time feeling regal with her husband, Lucius, at her side. But when evidence in the murder of a powerful elder points to Lucius, sending him into solitary confinement, Jessica is suddenly on her own. Determined to clear her husband’s name, Jessica launches into a full-scale investigation, but hallucinations and nightmares of betrayal keep getting in her way. 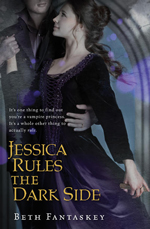 Jessica knows that with no blood to drink, Lucius’s time is running out. Can she figure out who the real killer is—and whom she can trust—before it’s too late? Jessica’s journey is about what happens after the happily ever after. She’s surrounded by men (befanged men) and politics, and in the way of most people starting a new life, needs to find this ‘new’ self. Is it all of the old self, just in better attire? or is it parts of the old self, with new thrown in? This was a highly anticipated sequel for me. I am completely in love with the journey I took in Beth Fantaskey’s first novel, Jessica’s Guide to Dating on the Dark Side. Beth’s characters are three dimensional. I really enjoyed getting to know them as they got to know each other. I couldn’t imagine what would be next for Jessica and Lucius. Fantaskey answers this question in Jessica Rules the Dark Side. The tone and mood is unexpectedly a lot darker. I had a bit of trouble getting into the change but I was soon rewarded for my patience. This new direction gives us readers a great chance to see Jessica come into her own as a woman and as a princess. She is dropped in the middle of this world full of old traditions, rituals, rites, and grudges. Jessica is forced to navigate these new waters on her own terms. Will she succeed? Don’t despair, dear readers. Beth gives Jessica some new friends along with her wise-cracking, no-nonsense, bit grumbly best friend, Mindy for help; keeping any Fantaskey fan avidly reading along as Jessica challenges this new world.